Dr. Robin Kimmerer of the SUNY College of Environmental Science and Forestry (ESF) has won the John Burroughs Essay Award for "Council of the Pecans," published by Orion Magazine in its September/October 2013 issue. "In 'Council of the Pecans' Kimmerer writes with a naturalist's knowledge, a poet's imagination and the narrative grace of a fine storyteller," according to an announcement from the John Burroughs Association. Kimmerer weaves the social history of the Potawatomi Native Americans with detailed biological information about pecans, especially their abundance during mast fruiting, thereby giving substance to the value of sacred land. "Not only are the pecan trees a model for human behavior, but they are a symbol for the resilience of Kimmerer's Potawatomi peoples. She writes with a sensitive descriptive hand, knowing the effectiveness of varying sentence rhythms along with an awareness of concrete verbs in telling her informative and moving story of the metaphorically expressive 'Council of the Pecans,'" the announcement states. Kimmerer, a member of the Citzizen Potawatomi Nation, is a Distinguished Teaching Professor in the college's Department of Environmental and Forest Biology. She was awarded the John Burroughs Medal for distinguished nature writing in 2005 and is the only person to have won both the John Burroughs Medal and the John Burroughs Essay Award, according to Lisa Breslof, press director for the John Burroughs Association. Her writings have appeared in Orion, Whole Terrain and numerous scientific journals. 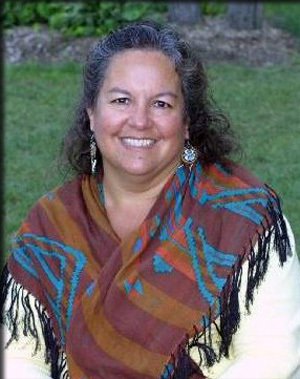 She is the founder and director of ESF's Center for Native People and the Environment. The award will be presented on Monday, April 7, at the Annual Literary Awards ceremony of the John Burroughs Association during a celebratory luncheon at the American Museum of Natural History in New York City.